Includes An Original Knitting Pattern! A nice sit down and relax read, characters are very endearing. This story continues the family on the Ormond Beach series. The connection to the people and the common experience,s are normal. Second book in An Ormond Beach series! Stitches in Time by Terrri Dulong is the second book in An Ormond Beach novel series. Isabelle Wainwright is moving to Ormond Beach, Florida with her fourteen-year-old daughter, Haley to start a new life. Isabelle is recently divorced. Isabelle and Haley will be staying with Chloe Radcliffe (she was going to marry Isabelle’s father before he passed away) in Koi House (a beautiful Victorian) owned by Mavis Anne Overby. Isabelle will be working with Yarrow to help start her delivery program for her coffee, tea, and treats for Nirvana Tea and Coffee. Isabelle is hoping this warm, loving atmosphere will help her and Haley to heal. But then she gets word that her estranged mother is coming to visit. Iris Brunell left her family when Isabelle was fifteen years old and their relationship has never been repaired. Is Isabelle ready to try and mend the rift between herself and her mother? Also, can Isabelle move on with her life when a new man enters her life? Chadwick Price re-enters their lives (they met a year ago). Chadwick and Isabelle click, but is it the right time? Can Emmalyn Overby help Isabelle move forward with her life into a beautiful future? 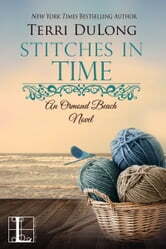 Stitches in Time was a lovely story. We get to reconnect with Chloe, Yarrow, Mavis Anne, and Henry. We also get new characters with Isabelle, Haley, and Petra. I love the yarn descriptions provided in the book (and the project they are working on). I give Stitches in Time 4 out of 5 stars (I liked it). It is a sweet, though predictable novel. I like how the author shows us that there are two sides to every story. You need both sides to understand the whole story. Stitches in Time is well-written, has a good pace, and great characters. There were times when I wanted to shake Isabelle (she was so obstinate), but everything worked out in the end. At the end of the book we get to see who will be the focus of the next An Ormond Beach novel which I look forward to reading. I received a complimentary copy of Stitches in Time from NetGalley (and Kensington) in exchange for an honest evaluation of the novel. Loved this series on book 3 right now ....so hoping for more in the series......perhaps Yarrow.....as Haley grows up... :) :) Happy Writing and Reading! !